Those of you who watched Channel 5’s Secrets of the Supermarkets last night will no doubt, like Alex Gazzola, be fuming this morning…. 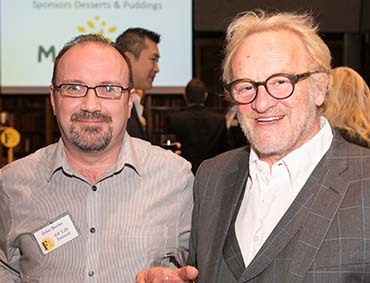 Alex was so cross with Chris Young, the Real Bread Campaign’s spokesman who appeared on the programme, that he had already leapt into print on his Allergy Insight blog last night. I have no problem with people asking why gluten free food and gluten free bread in particular is significantly more expensive than non-gluten free – or asking whether gluten-free foods are intrinsically healthier than non gluten-free. But having asked the question one needs to give both parties to the discussion a chance to put their points – and the programme did not. Alex was understandably cross with a bread expert who said that since it was impossible to make bread without gluten, any bread that contained anything other than wheat flour, water, yeast and salt (i.e. all of those gluten-free breads which, because they are gluten free, doh…. do not contain gluten) was not bread. Do read his blog – he makes really good points. However, this raises two issues. 1. What if you cannot eat gluten? 2. And what about all other breads out there which contain a good deal more that just wheat flour, water, yeast and salt? So before going overboard on gluten free bread, maybe Chris Young should also have taken a pop at the 95% of non-gluten free bread on supermarket shelves. It also contains good deal more than flour, water, yeast and salt – including several of the ‘chemicals’ that he was condemning in gluten free breads. For example E471 and 472e (Mono- & di- glycerides of fatty acids and mono and diacetyltartaric acid esters of Mono- & di- glycerides of fatty acids), were both among the ingredients of a loaf of Kingsmill 50/50 I looked at in the local corner shop this morning – both fatty acids which, like the E464 highlighted in the gluten free bread on the programme (hydroxypropyl methyl cellulose) are universally recognised to be ‘safe’ ingredients for human consumption. And if, as Chris Young maintains, making ‘real’ bread with gluten is impossible – what are those who cannot eat gluten, and those who try to create food for them, meant to do? Just cut bread, the staff of life, out of their diet altogether? Or try to find some way, with the help of other natural grains and, perish the thought, even a bit of science, to create something which is at least a reasonable simulacrum or ‘real’ bread? Why is gluten-free food more expensive? 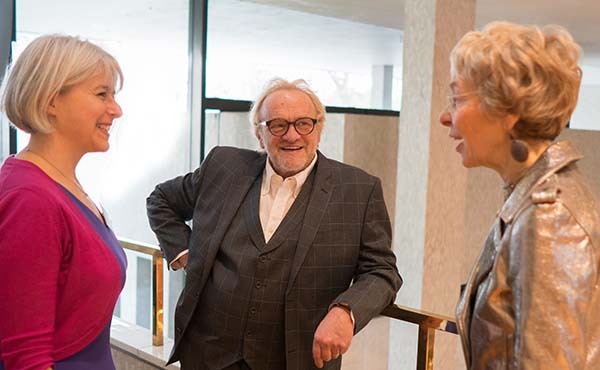 But while Alex was especially infuriated by the Real Bread man, I was more disappointed by Joanna Blythman, a journalist and food campaigner who I respect enormously. 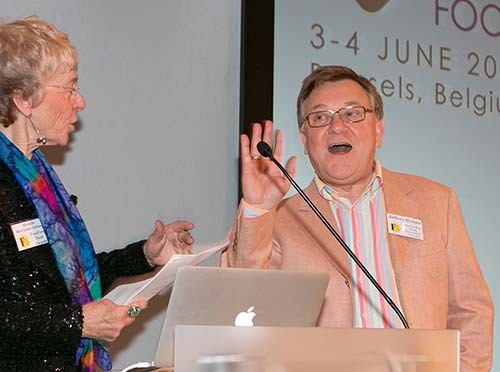 Instead of asking why gluten free food, and bread in particular, was more expensive than non-gluten free, she made the cheap assumption that supermarkets and the gluten-free bread brands were just ‘jumping on the gluten-free gravy train’. Ingredients. The wheat flour that is used in ‘normal’ bread is produced in vast quantities in UK mills with all of the savings that bulk production and delivery brings with it. All of those different flours that Chris Young mentioned as being used in gluten free bread are more expensive than standard wheat flour, more difficult to get (often needing to be imported) and come in far small quantities – and are therefore significantly more expensive. 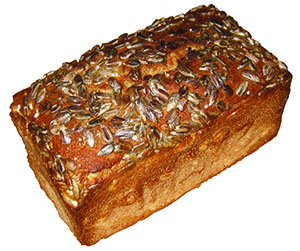 Replacing gluten – to try to recreate the stretchiness of gluten you need many more ingredients – up to 20 – many of which have not been designed for bread making so need further processing. Traceability – all of these ingredient have to go through strict non contamination tests which are not required for ‘normal’ bread ingredients. Technical costs – a large modern wheat flour bread factory is highly automated and all but runs itself. Production units for gluten-free bread are very much smaller and less automated, requiring higher staffing levels. The complexity of making gluten-free bread also requires constant supervision and even so, there are high levels of product rejection and therefore scrappage. I am certainly not saying that there are no ‘freefrom’ manufacturers who push the price limits a bit – it will also be so. But maybe both Joanna and the programme should have looked a little more carefully into what was involved in making gluten-free products before branding them as a universal ‘rip-off’. And finally to the ‘is gluten free healthier’ question. 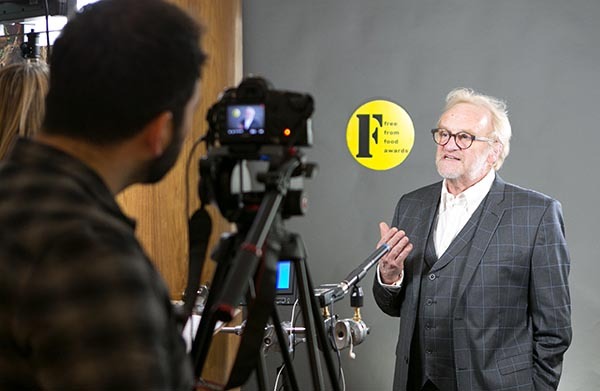 The British Retail Consortium at the end of the programme gave a statement to the effect that the industry does not represent ‘freefrom’ foods as being healthier. The ‘healthier’ claims came from the media, lifestyle coaches and celebrities – which is essentially true. My personal explanation of why so many people believe that they are healthier on a gluten free diet is that the improvement in their health is only marginally to do with cutting out gluten. How come? Well…. In order to cut out gluten you have to start paying serious attention to what you are eating, which includes reading ingredients labels. Many people are rather shocked by what they find on the ingredient labels of their favourite foods and therefore decide to cut down on them. If you are going to genuinely follow a gluten free diet you will not be able to eat many of the ready made products which may have formed a large part of your diet. You will therefore be forced to cook more from scratch or, at the very least, to eat more fruit, vegetables and salads which are already gluten free. De facto, a healthier diet. If you have started looking at your diet that will almost inevitably cause you to look at the rest of your life style. If you are doing the diet, why not go for it and clean up your act more generally. As a result you may decide to take a bit more exercise (walk, go to the gym, climb the stairs instead of taking the lift), drink or smoke a bit less, got to bed earlier/get more sleep – maybe even got to the mindfulness or yoga class that you have been thinking about for ages. All of which these have a beneficial effect on your health and you will feel better. But because the trigger was trying a gluten-free diet, that is what gets the credit for the improvement. This is an important subject. No one in the freefrom world actually wants to rip off any one. 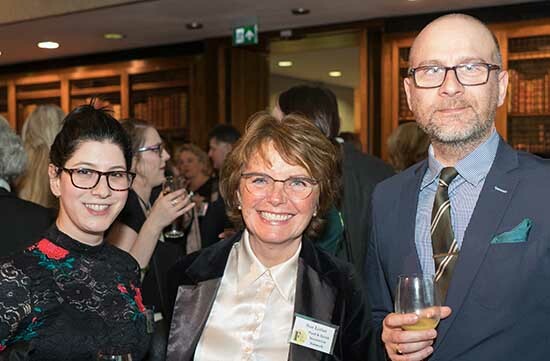 Ninety per cent of the manufacturers in this area are there because they, their family, or someone they know has a genuine deitary problem and they want to help. Yes, of course they want to make money too – we all have to live – but unlike in so many other industries, their motivation is not just the bottom line. If they can make the products healthier and cheaper, they will do so – but they have to be able to make living doing so. If they can’t the products will not exist at all. And that would impact very seriously of the quality of life of those who, for genuine medical reasons, do need to eat gluten free. Presenting…. 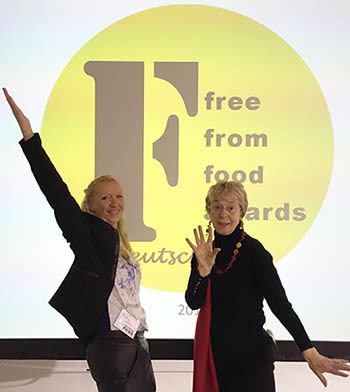 The first German FreeFrom Food Awards! 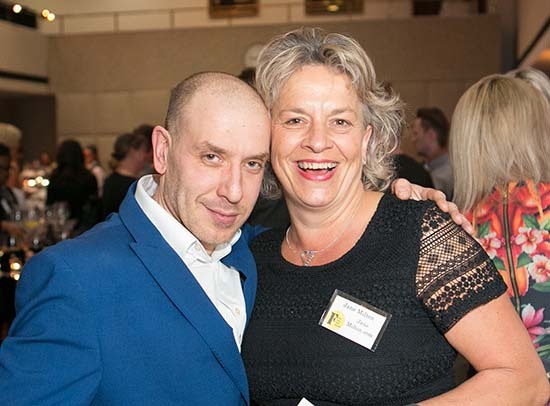 And here we are, Bea, our lovely awards presenter and me. All ready to announce the winners of the first ever German awards, to a pretty packed audience at the back of a pretty packed Allergy + FreeFrom show in The Station in Berlin. 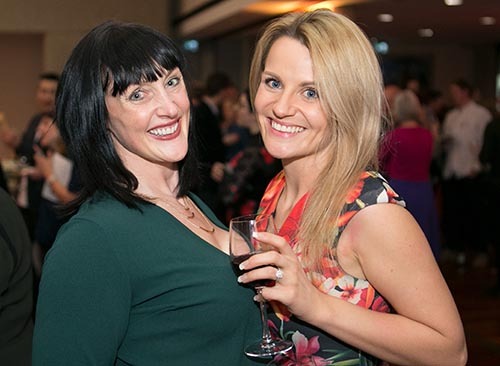 The awards had been a roaring success with over 150 entrants in year one (we had been hoping for around 50!) – coming from both local German food companies and a few UK freefrom manufacturers anxious to break into the burgeoning German market – Genius, Bute Island, Keogh’s crips from Ireland, the Coconut Collaborative. 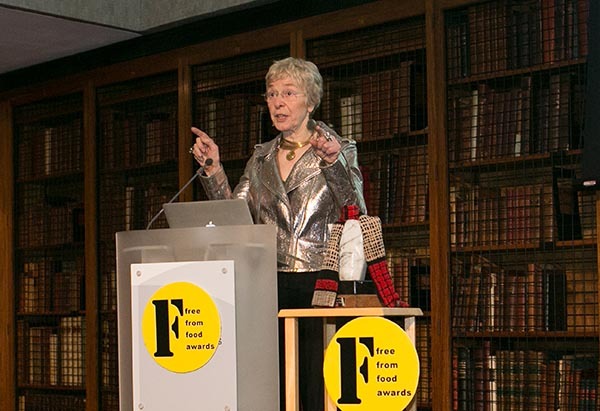 Proceedings started with a brief history of freefrom and the FreeFrom Food Awards from me and then a fascinating short talk from Lucinda Bruce Gardyne of Genius Gluten Free (both sponsors and entrants into the awards) about the technicalities of making bread without that essential ingredient, gluten. Then it was on to the winners…. Breads and Breadmixes were won jointly by an organic and wonderful black-bread mix made by Bauck (a very happy winner as you can see!) – Bio Schwarzbrot, Backmischung, glutunfrei and by a gluten-free raisin bread – Spezial – Diāt- Bäckerei Poensgen Rosinenbrot. Cakes & Sweet snacks also had joint winners – but two very different ones. The cake section was won, very much to their delight, by Genius Gluten Free with their Chocolate Muffins and the sweet snack section by some lovely dried fruity snacks from Päx Foods – Päx Food Knusprig gePÄXter Frucht-Mix Rot Süßwaren. 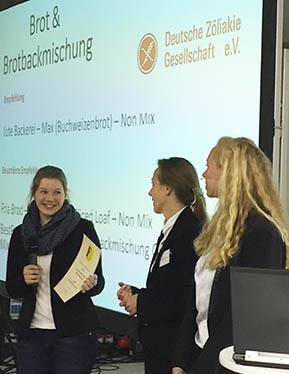 Breakfast cereals went to an organic, gluten-free oat and fruit muesli Bio Hafermüsli Früchte, glutunfrei which also came from Bauck – which made their happy representative, seen getting her certificate above, even happier!! There were two snack winners, Convenience snacks and Health snacks. 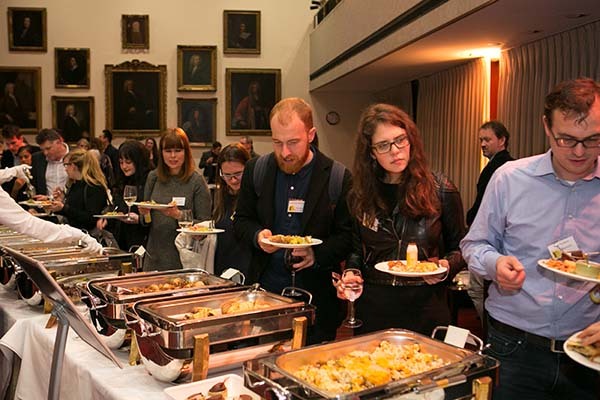 The convenience snacks went to Keogh’s Irish Atlantic Sea Salt Crisps; the healthy snacks to – yes, yet again, Bauck with their organic, harissa falafel mix – Bio Harissa Falafel, Fertigmischung, glutunfrei. Pasta and Pizza winners were Dr Schär with their Lactose (and gluten) free Margherita Pizza, also, unless I am much mistaken, to be found in the UK, and another super excited winner, Ruki who make gluten-free, lactose-free, wheat-free fresh noodles, ravioli, dumplings and gnocchi. 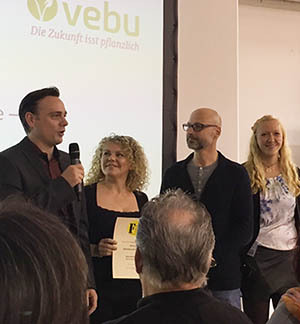 The milk alternative category, which was sponsored by the German Vegan association, VEBU, was entirely taken over by Brits! 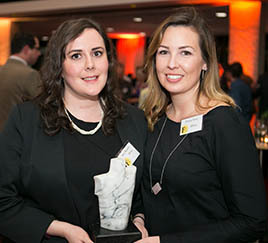 Here are Bute Island receiving their award for their Original Creamy Sheese; their fellow winners were the Coconut Collaborative for their Mango and Passion fruit Yogurt. 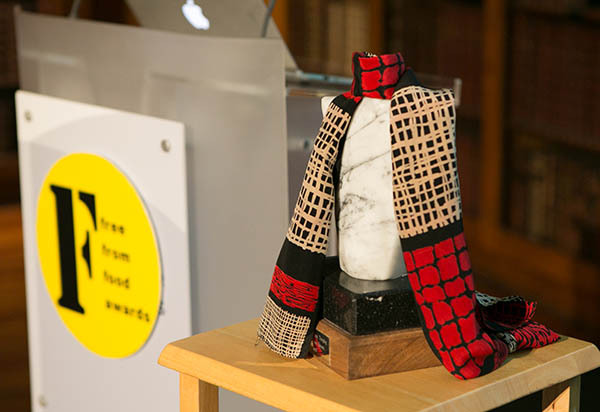 Confectionery winner was a very delicious looking lemon lolly, Gurke-Zitrone and the drinks category was won by an old FreeFrom Food Awards favourite, Celia Organic! There was also a large entry for the Vegan meat alternative category, a very popular food in Germany where vegans are a good deal more in evidence than in the UK. The winner here was a sort of ham loaf with paprika – Ruegenwalder Vegetarischer Schinken Spicker mit bunter Paprika. 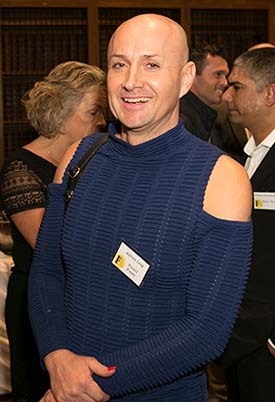 However, the most unusual entry, which was also the winner, was for the Innovation category. This came from Katjes Magic Candy Factory – a 3-D printer which can create your own (as freefrom as you choose to make them) gummy candies!! 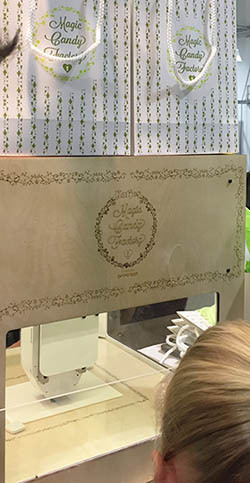 Katjes Magic Candy Factory actually had a printer at the show and was creating candies for us as we watched! In any shape or colour that you choose – you just need to feed in your chosen ingredients! If you are interested in how this actually works – check in to 3DPrint.com here were they have a full article about the Candy Factory and its developer Melissa Snover, the founder of the Goody Good Stuff range of gummy sweets. 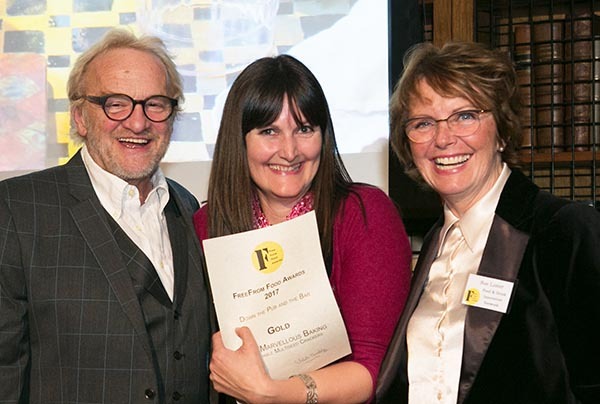 So, a very successful launch for the latest FreeFrom Food Awards child!! 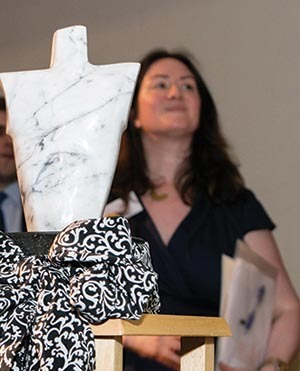 Much fuller details of all the winners plus the commended and highly commended products will be on the German awards site very soon, just as soon as the team have got themselves back from Berlin and drawn breath…. 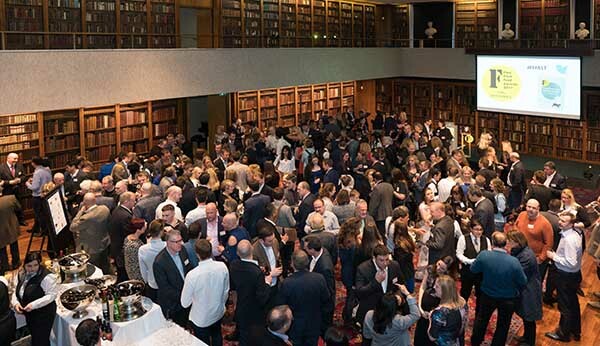 Meanwhile, of course, they will be followed VERY rapidly by the one and only original FreeFrom Food Awards presentation in just eight days time on April 26th when all will be revealed at the Royal College of Physicians in Regents Park! 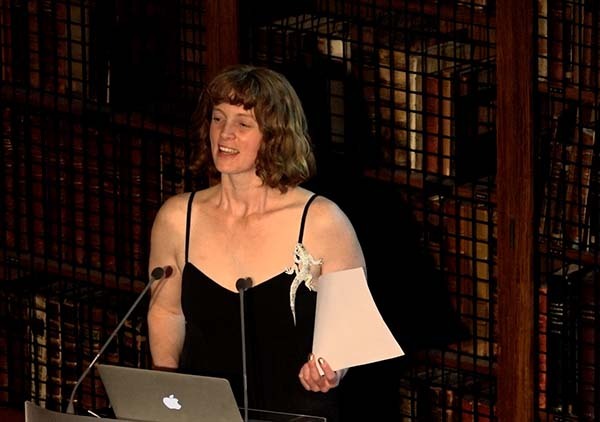 And just in case you think that all I did when in Berlin was to help present awards – oh no…. 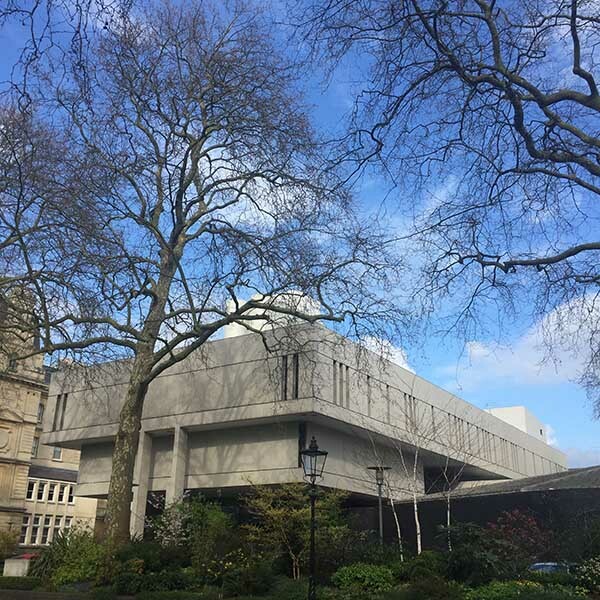 Coming up very soon, Daniel Libeskind’s extraordinary Jewish Museum – and the world’s most amazing sock shop!!! Why is gluten-free food so expensive? 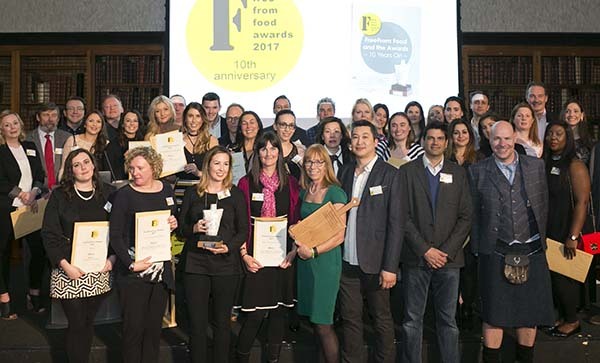 I am afraid we are up to our eyeballs in the FreeFrom Food Awards judging at the moment so neither managed to see the Channel 4 programme yesterday nor read the Mail/Sun. But, thank goodness, Alex is on the ball and has covered the subject for us on his Food Allergy and Intolerance Ink blog – see here. 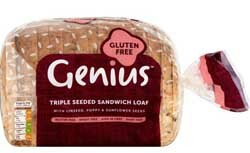 The only thing that we would add for general interest is a link to an article that Lucinda Bruce-Gardyne, founder of Genius Gluten Free, wrote for us last year explaining why making gluten-free bread was so much more expensive than making a standard supermarket loaf. However, bread is one of the hardest products to make ‘freefrom’ so, while there is certainly some excuse for it being more expensive, the same does not go for look-a-like products such as the Tesco tomato ketchup that Alex quotes (£1.20 for the ‘freefrom’ version, 65p for the ordinary one) when the only possible extra expense could be extra testing for allergen contamination. 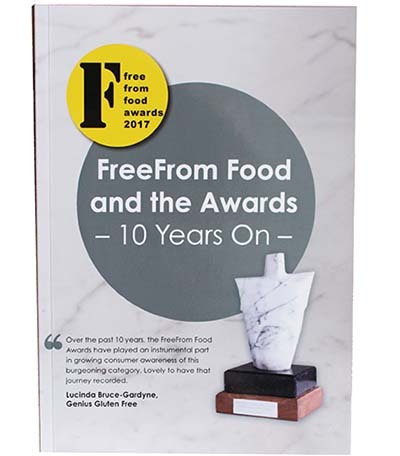 Filed Under: Allergies, Coeliac/celiac disease, Food, FreeFrom Food Tagged With: Alex Gazzola, Food Allergy and Intolerance Ink, FreeFrom Food Awards, Genius Gluten Free, Lucinda Bruce Gardyne, Tesco tomato ketchup, Why is gluten-free food so much more expensive? 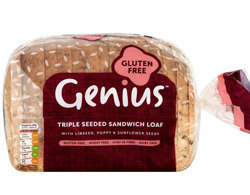 Sunday Times readers may have seen the much respected Joanna Blythman’s ‘exposé’ of gluten free bread yesterday in which she points out, quite rightly, that gluten-free supermarket bread is laden with manufacturing aids – as, of course, are non gluten-free supermarket breads! 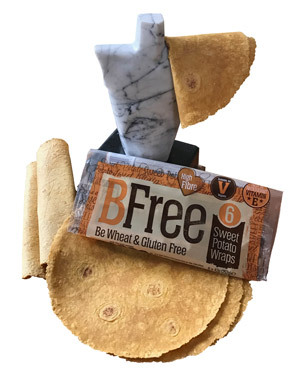 However, since I do not believe in reinventing the wheel, I will say no more as Alex has just written an excellent blog – Gluten-free bread: Is it really so bad? – that says it all. Please read!